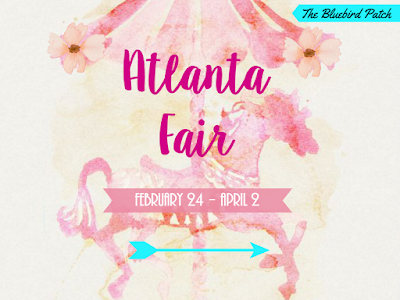 Atlanta’s favorite fair is back and fair gurus from near and far are invited to enjoy this one-of-a-kind experience! All season long, guests can expect to be dazzled by vibrant displays and lights and partake in a variety of interactive games. Those in search of soaring thrillers will be able to climb aboard one of the many attractions, including the Towering Ferris Wheel, Flying Dutchman, 45-foot Ring of Fire and for the first time ever, the Inversion, a twisty sky-high tower that will have adrenaline junkies spinning and twirling into the crisp spring air! Foodies can also indulge in the endless supply of all-time classics, like fluffy cotton candy, candy apples, elephant ears and more! Standard fair entrance fees are $1 for children shorter than 42”. For guests taller than 42”, fair entrance fees are $3 (Monday – Thursday); $5 (Friday, Saturdayafternoon and Sunday) and $8 (Saturday evening). Midway ride tickets can be purchased for $1.25 each and unlimited ride armbands are available for $25 each. To purchase tickets, visit atlantafair.com.